I love breakfast foods. There is something so great about a big stack of pancakes, especially when the rest of the day has been less than perfect. In college I was known to study until the early hours of the morning and I quickly learned that 24 hour greasy spoons were a great place to study. They had unlimited amounts of free coffee and delicious breakfast foods (which often served as both my dinner and breakfast since I was always running from school to work to study). Making pancakes at home was always a problem for me. They never turned out as great as they did at my favorite diners and I literally switched to making waffles until my kids were born. Then I discovered what a difference a great griddle makes. No more burnt pancakes and lots and lots of yumminess. This week I tried a new recipe for Blueberry Buttermilk Pancakes from the March 2013 issue of Martha Stewart Living magazine. This recipe has 13 ingredients. It takes 15 minutes of prep, plus the time for the pancakes to cook and makes 12 pancakes. I did make a few modifications. First I used low-fat buttermilk since it was what I already had in my fridge. I try to cut down on dairy fats whenever I can. Instead of all-purpose flour I substituted brown rice flour since I can't eat gluten. Finally I found that since I used a indoor griddle/grill my cooking time was slightly longer than the time suggested by the recipe. My youngest son absolutely loved these. Make sure to let the pancakes fully set before you flip them or you will end up with patches of soggy pancake around the blueberries. I ate a number of these pancakes and really enjoyed them. They were delicious with frozen blueberries and maple syrup for breakfast. This is a recipe I would make again. 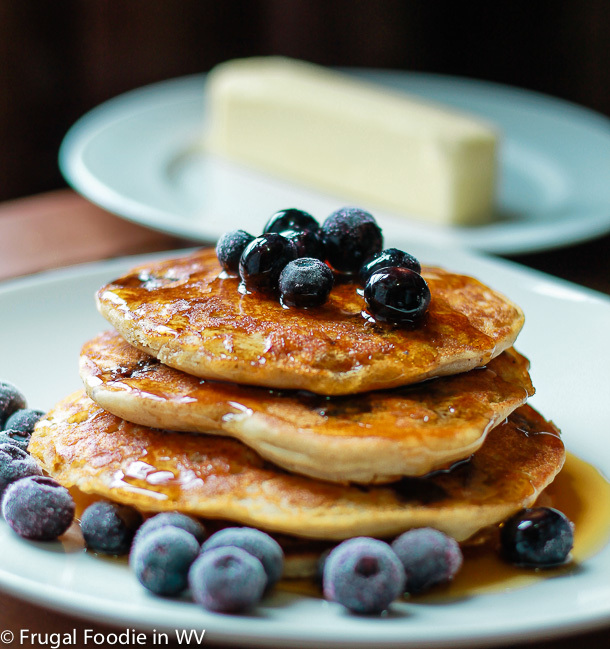 For the recipe go to Blueberry Buttermilk Pancakes. What kind of griddle did you use? These look really good. And I like that you put the tip on the grill setting. Thanks :) They were tasty! I love, love, love blueberry pancakes. They're my favorite! Mmmm, you know, I haven't had a good stack of pancakes in quite a while! I always used to, but then started moving into french toast and waffles. I need to come back again! They look delicious! Just dropping by from Linking with my Ladies. Thanks :) Come back and visit again soon! I tend to eat a little later in the morning also :) Breakfast for dinner is always delicious! Man that looks AMAZING! I envy your food pictures skills! These pancakes look so delicious! I never made blueberry pancakes before - I'll have to give them a try. They are really easy I promise :) Plus it made enough for multiple meals (or two growing boys!). I think I just gained 5 pounds looking at the photo! Your picture had me drooling! I can eat breakfast at any time of the day, and dinner too! Pancakes are a fav! Blueberries make them better! I LOVE pancakes! Thanks for linking up at Family Fun Friday. Followed you back :) If you try the recipe tell me how it turns out!